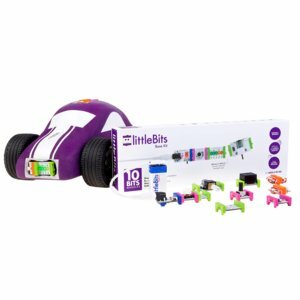 littleBits Base Kit helps to get started inventing with electronics as easy as it has ever been. The Base Kit is the perfect way to unleash creativity in kids and young inventors, empowering them to create inventions of every shape and size, with no prior electronics experience. You can learn the basics of electronics, explore STEAM/STEM principles, form the foundations of critical thinking, or just have fun with blinking, buzzing creations. Bits snap together with magnets, so it’s impossible to make a mistake. They are color-coded and devided into categories: motor, button, power, led light, sensor. The Base Kit comes 10 Bits and a step-by-step guidebook to get you started with 8 easy-to-make inventions, with hundreds more possibilities online. You can control a car with the DC motor and light sensor, or scare your friends with a hidden button and a buzzer. It’s the perfect way to get little inventors building, with no soldering, wiring or programming required. Over 150,000 possible circuit combinations. Includes instruction book with 8 projects and hundreds more online. Download User Manual for LittleBits Base Kit. DC motor — 1 pc. light sensor — 1 pc. bargraph module — 1 pc. bright led — 1 pc. motor accessory — 1 pc.